The continued growth of the Southeast Asian region is likely to bring it greater prosperity. But it is also likely to see the rise of human trafficking and other corrupt activities as labour-intensive industries demand greater production numbers, quicker and cheaper. The report also quotes an International Labour Organization (ILO) estimate that the human trafficking industry nets US$32 billion annually. Ruici Tio, a recent hire as a Director at Kroll, brings his practical experience in investigating these clandestine activities in the region. Having worked with USAID in Jakarta, he followed that with a spell in Bangkok with MTV EXIT (mtvexit.org), which strives to thwart human trafficking. MTV EXIT estimates that close to 21 million people are victims of human trafficking, and is profitable to the tune of $150 billion, almost five times the figure provided by the ILO. Singapore-based Ruici has worked in a dozen markets in Asia, Europe and the US, facilitating partnerships between the public and private sectors around ethical and societal issues. One of the challenges he faces is the lack of accurate data on the topic, which makes it anyone’s guess as to the extent of the problem. “Technology and big data give a bird’s eye view. But the data is only as good as the source. For companies operating in opaque places, you still need human intelligence on the ground,” Ruici explains. Regardless, the fact is it is profitable, and those engaged in it are well aware of the grief and harm it causes to individuals, families, communities and companies. Ruici Tio is a panelist in STORM’s event Keep It Going: The Next Big Thing. 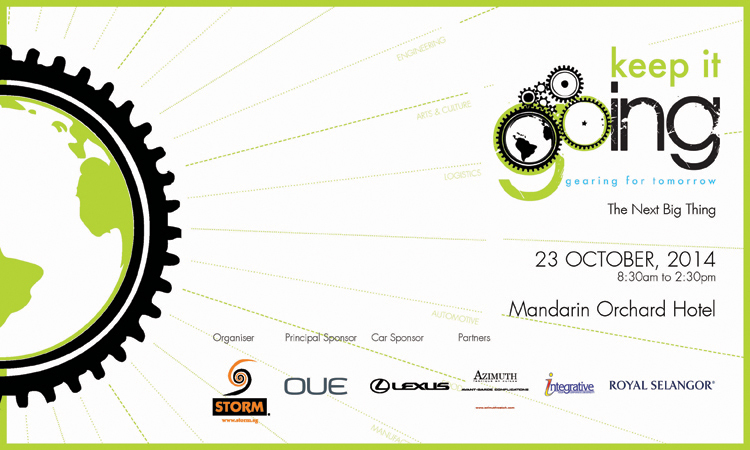 View more details of the event in Keep It Going 2014. The Next Big Thing — The plans are in place, the path has been plotted. Before you hit the launch button, you should ask yourself if you are doing so in a bubble. With the world increasingly interconnected, many decisions we make in business and in life are often influenced by other factors beyond what we see in our near field of vision. Sometimes, they come hurtling in like missiles from afar, out of the blue. Look out for more stories in this series. Can Singapore Disrupt Its Way Forward? Are You A Disruptor Or A Dinosaur?